Christmas Tour of Homes 2010! Immediately upon walking in, you would see our Christmas tree which we planted right in front of our "Wall of Windows" this year. I love the way it looks both during the day and the night time! I also like walking into the house and seeing it first thing! If you look to your right hand side, you'll see my nativity set which I display on the bookcase under and over the staircase. My aunt gifted me with the starter set of this Nativity Set the year Jonathan and I were married and every year or so I've added another piece to it. This year I finished off my set by adding the wise men. If you step over into the dining area, you'll find our second tree, overlooking our neighbor's house and a tree-studded hill in the distance. I love our little eating nook. This tree is my nod to my Texas heritage, as I've included stars, etc. for the Lone Star State. (But if you know me, you know I'm not all that big on Texas, much preferring Oregon - thankyouverymuch!) But sometimes a little Texas pops out and in the case of this tree, it showed up as little red speckled stars. Lastly, one of my favorite little places to celebrate Christmas this year is opposite the dining area. This is the little nook in my bedroom and you'll notice on the side of the couch here that there is a basket of books - some of which are still wrapped and others have been unwrapped. Naturally, this being a book blog and all, I cannot fail to mention our holiday reading practices! As I've mentioned, this year I wrapped and numbered all of our children's Christmas books and stories. 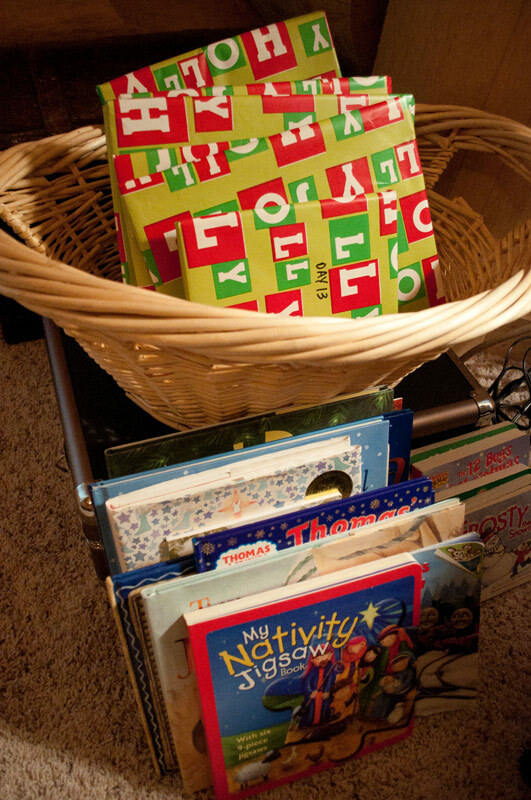 Every morning the boys and I check in with our advent calendar (and gobble down any goodies we might have found) and then we open our books and read for a bit. They are loving it and so am I! 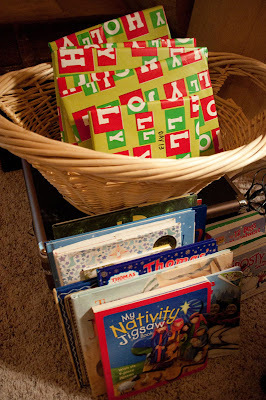 A lot of the books that you'd find hidden away in this basket I mentioned in my Christmas Books for Toddlers post (should you be looking for recommendations.) I'm still a few books shy to carry us through Christmas but that's ok. I've been watching other people's recommendations as well and will plan on adding some new titles to our collection next year! To tour additional homes, visit The Nester and/or Kelly's Korner. 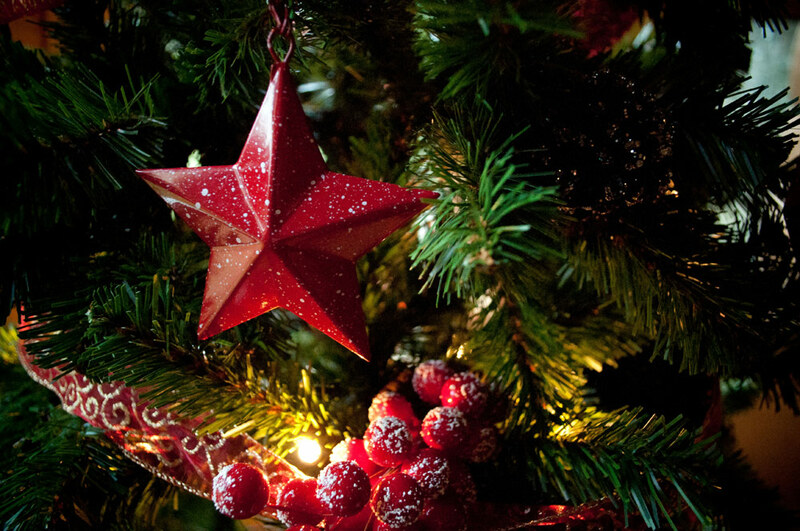 Have fun and MERRY CHRISTMAS! Oh wow....love your Christmas decor. That bear is stunning...love him! Thanks for popping by my blog...and a very Blessed Christmas to you and your family! All very beautiful and cozy! 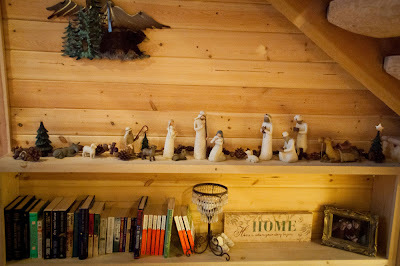 I love the Willow Tree Nativity... Just this year I've been thinking it would be cool to get a piece a year like that. I've enjoyed my visit to your home! What a gorgeous home you have Carrie! Everything looks very cozy, warm, and inviting! I loved getting to see around your home. It's beautiful!! What a beautiful home! Looks like a cozy cabin -- love that wall of windows! 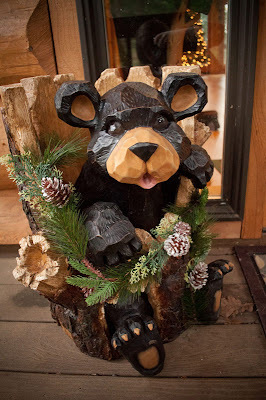 And that cute little bear cub greeter. I love the book idea. I loved your home tour. What a beautiful home. I use to live in a log cabin and really miss it. I would seriously love to join this at some point -- if I ever get settled in somewhere again! Your home looks beautiful, by the way. 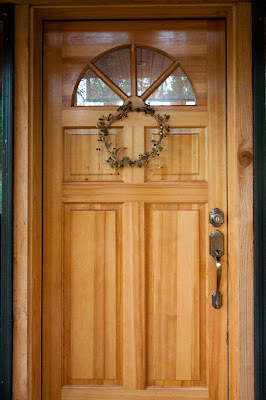 And the bear cub is adorable...in addition to the two boys peering out the windows to greet your visitors, of course! Oh, I wish I could come visit you at Christmas! 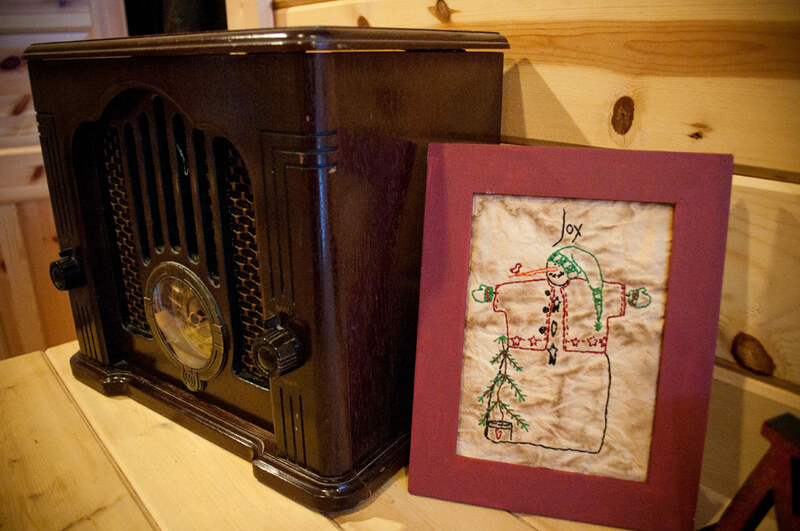 :) You have the nativity scene that I hope to someday collect as well! You've mostly already seen my Christmas decorations... tree. 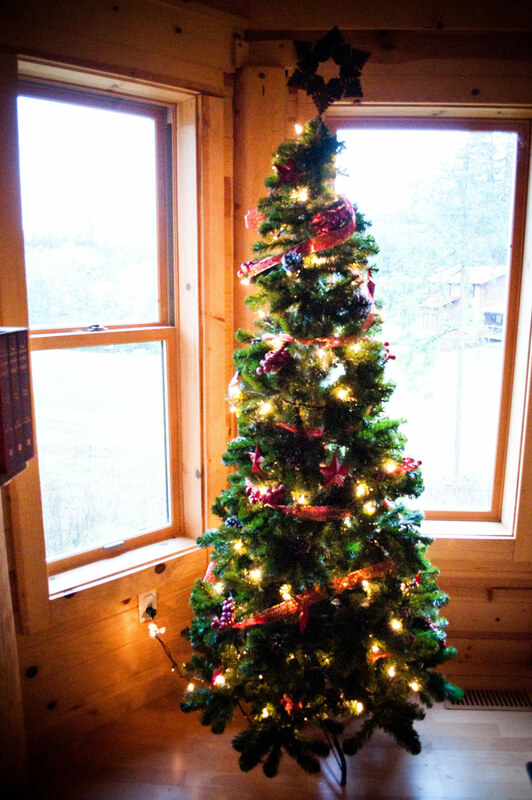 Your tree against the wall of windows is stunning! Love it! 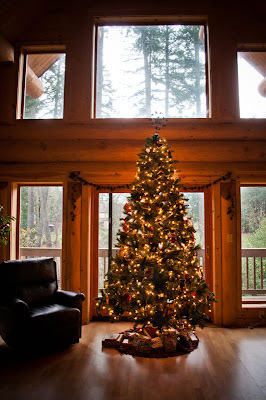 Just beautiful...your house, your tree, your blog! Beautiful! I love the fact that other trees can be seen in the background behind your Christmas tree because of your tall windows! 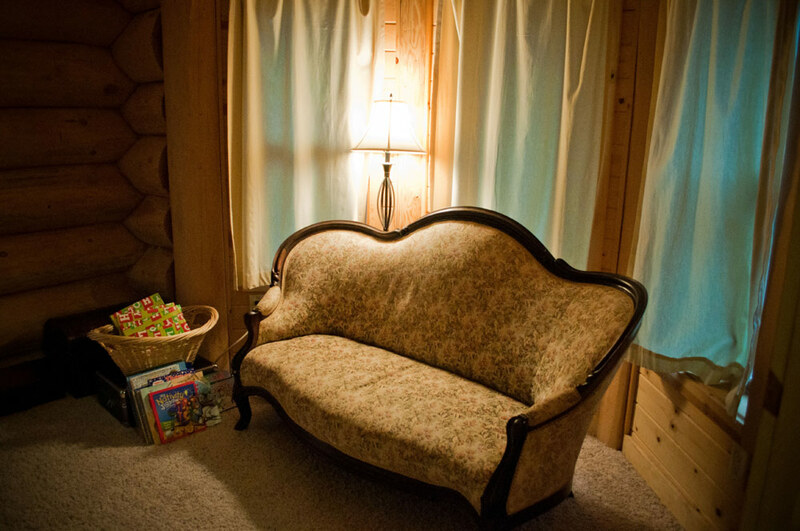 Also, I almost think I'll make a trip to Oregon just to sneak in and steal that awesome couch in your reading nook. Or maybe I'd settle for just sitting on it and seeing you. ;) This is a great idea--I'm inspired to do this sort of post as soon as I learn to get pictures off the camera. It's beautiful. I have the Nativity, too. Did you know that they added an ox & goat this year, though? I thought I had it finished off. I probably won't get them, even though they're gorgeous! holy moly your home is awesome!!!! love the view from the tree! Your home is breathtaking and so very cozy!! My hubby and I have always loved log homes, and we used to subsribe to some log home magazines when we were first married as we dreamed about having one. :-) I also saw that you were an Anne of Green Gables fan...yay!! May your home be filled with His joy this Christmas! Thanks for inviting us in to take a peek!